Well, I guess that makes it official. 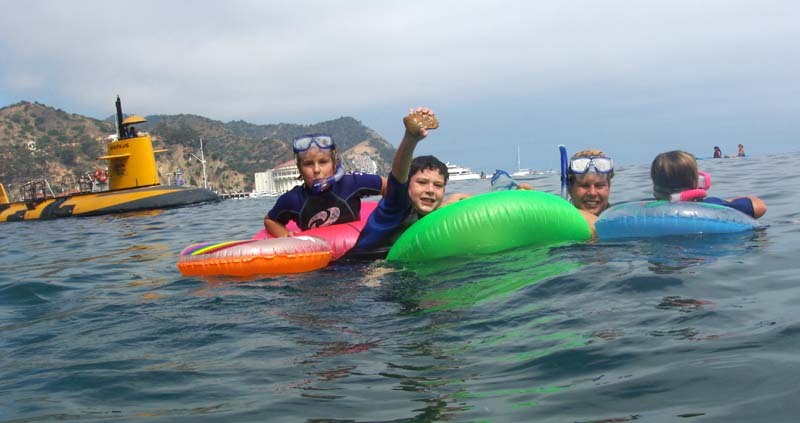 They had both been practicing with fins, masks and snorkels in the pool to get ready. Both could manage their gear well and free dive in the pool to retrieve stuff from the bottom. It was time to try the ocean. 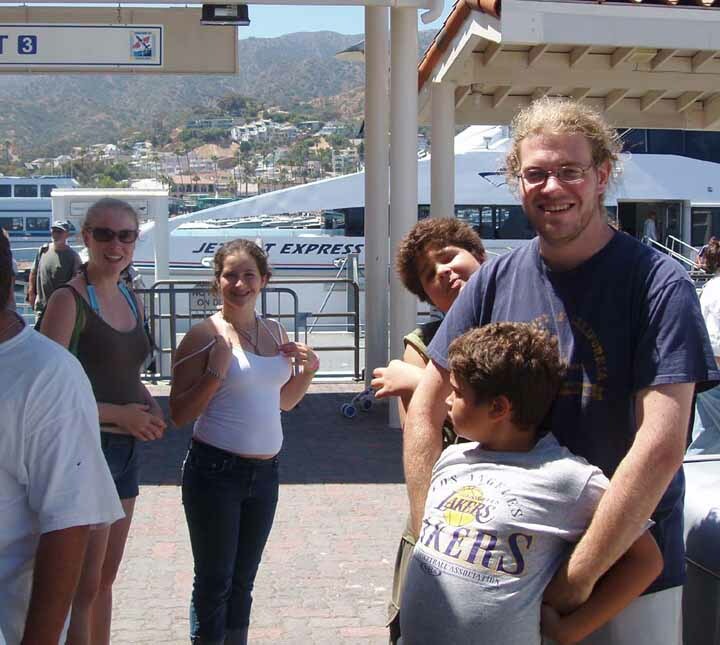 We got off early to Long Beach to catch the Catalina Express and they were all excited. There was a lot of fog through the LA basin, but it was going to be a sunny day. The plan was to go to the Lover's Cove reserve just south of Avalon. It is where the glass bottom boats go. They feed the fish there every day of the year and it shows. There are more fish there than any other place I have ever seen. 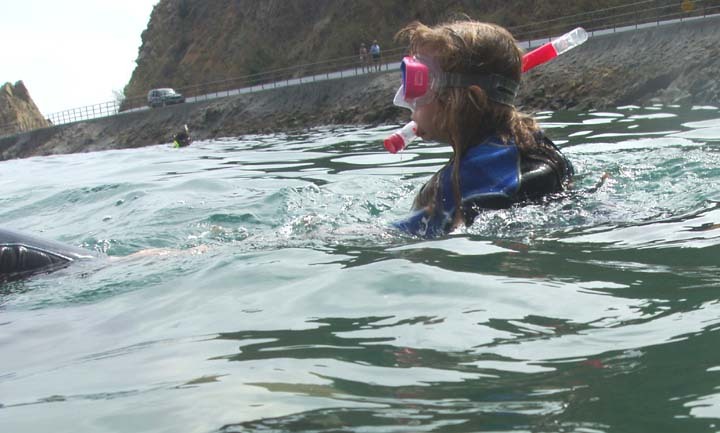 Scuba is not allowed, but snorkeling is. 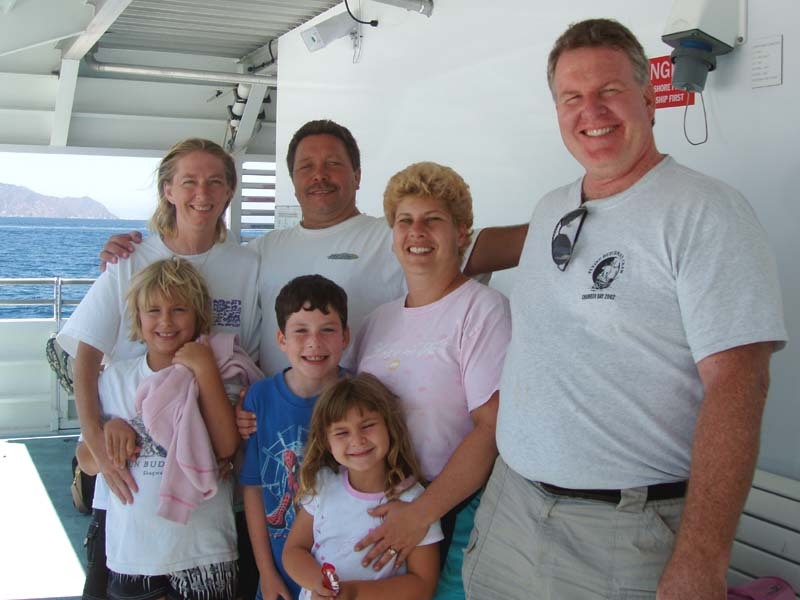 The trip had been planned for a more than a month and their friend from school, Brittany, was coming along as well as were her parents, Joe and Joanne. Joe was considering taking up scuba. Unfortunately, we found out at the Catalina Express office that they had screwed up our reservations and instead of returning at 3:45, we had to come back on the only open boat available at 2:05. That was going to make a short, rushed day. They were marginally apologetic and totally unhelpful for their mistake. All in all, I thought they were prize jerks there. 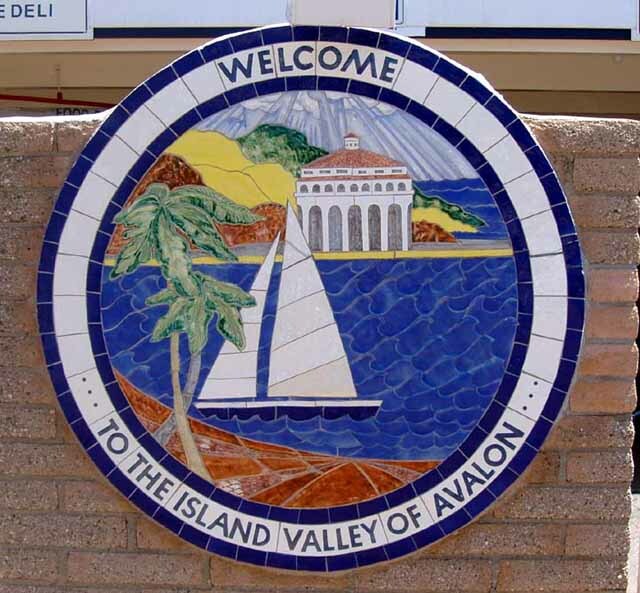 How would you like to live in Avalon? 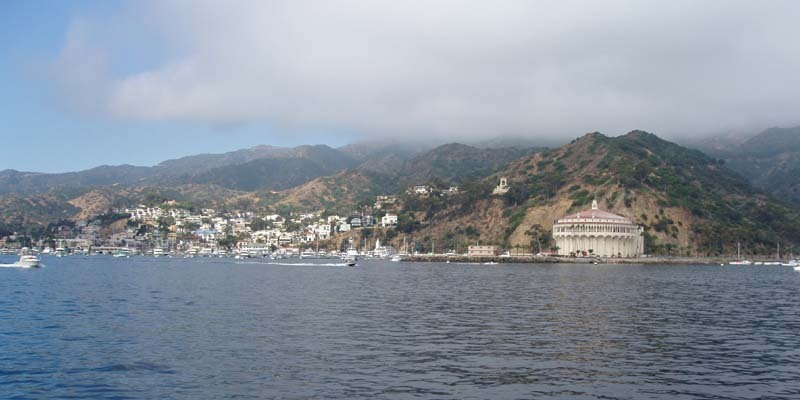 The Catalina Express Jet boats are beasts. Extremely large, heavy, very fast beasts. They were convenient as far as bringing gear and there was lots of room for gear bags in the back as you boarded. The kids enjoyed the trip over and by the time we got there it was already a sunny day. Avalon in the sunlight is beautifully picturesque. At the docks are large lockers allowing all day use for $4. We all suited up and stowed our dry gear in a couple of them. 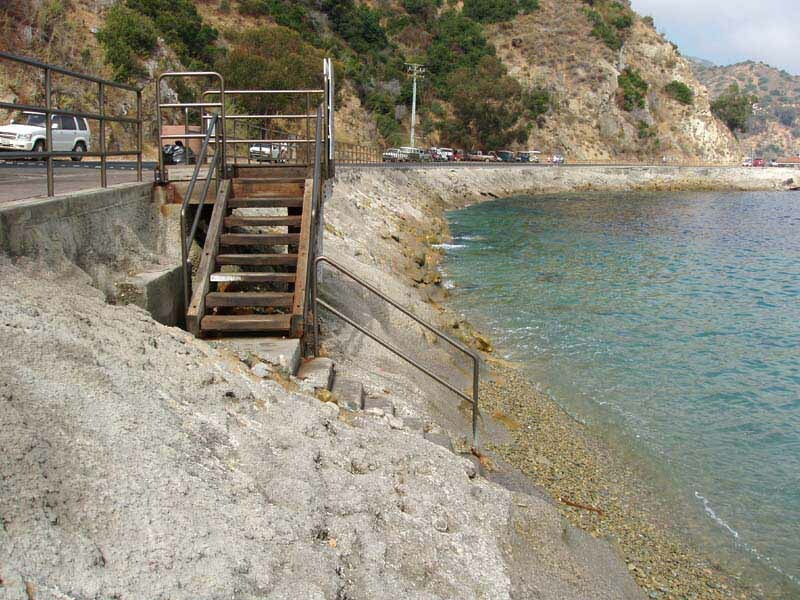 From the dock it was only about 130 yards to the stair leading to a small rock beach at the inside of the Cove. We had round plastic floats for the kids as well as about 5 pounds of fish food including some we bought there and abalone trimmings I have collected all year. I wasn't sure how the kids would do. 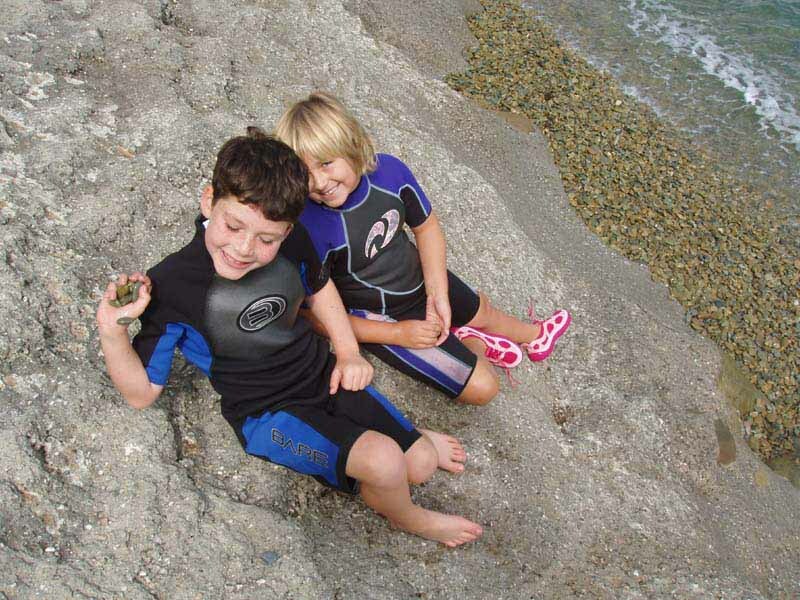 Joey is 7, Marissa is only 5 and is a small girl, but she is an adventurous little girl. 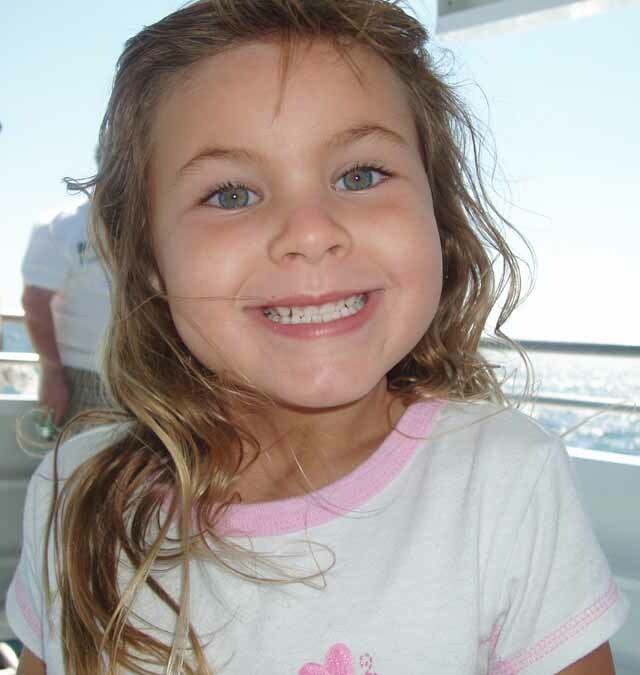 Brittany is 7 and was very capable in the water as well. They were not used to moving water with gear on and not surprisingly they had to go back to shore to get gear and wits composed. I gave Marissa a ride to shore sitting on my chest. In a little while, they were all back in the water, far more composed and fairly comfortable. Joey is doing his first ocean free dive. 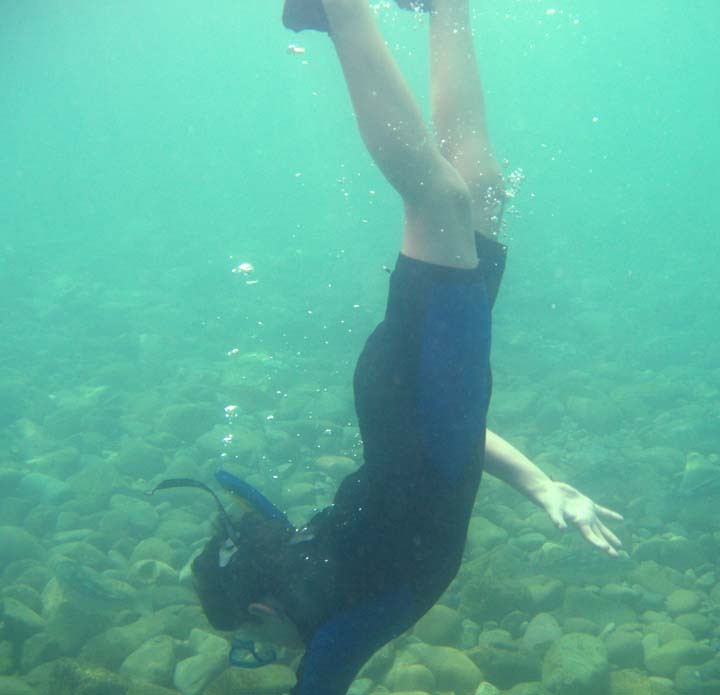 Joey was snorkeling on the surface, but I wanted him to do a dive to the bottom. 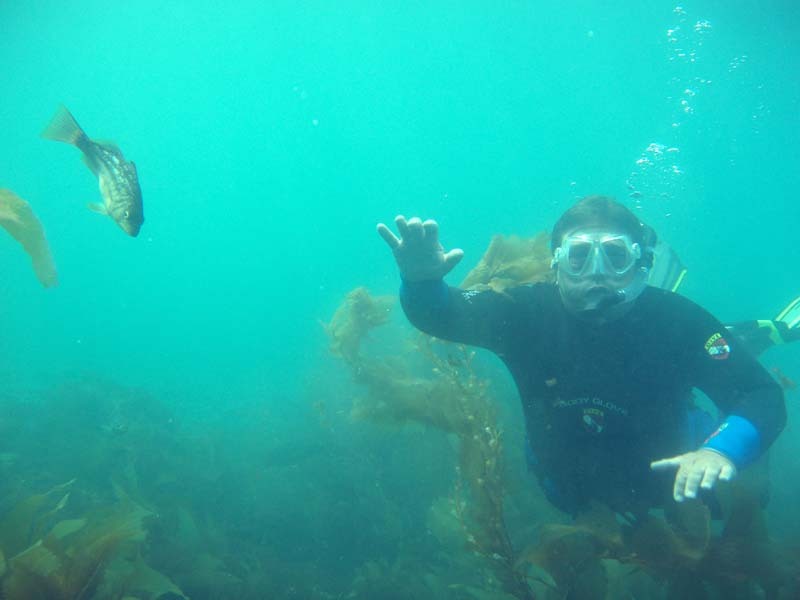 To pass my first ocean dive while snorkeling at Zuma Beach, I was required to go down and grab a handful of sand. I told him to go down and grab me a rock. He thought that was a great idea and promptly collected some rocks for me. He scored a rock. Brittany was surprisingly comfortable in the water. Unfortunately, Marissa was having a problem with the cold. 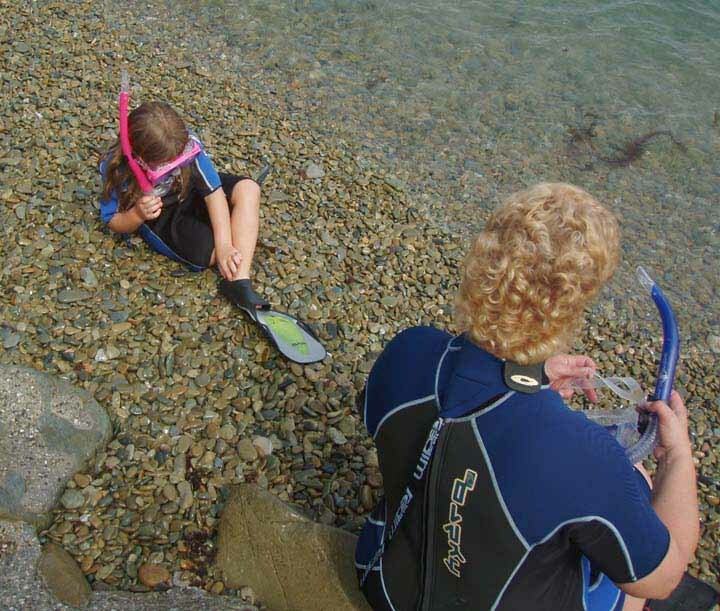 Her wetsuit was not a great fit either. She finally decided to stay on one of the floats and look through the middle at the action. 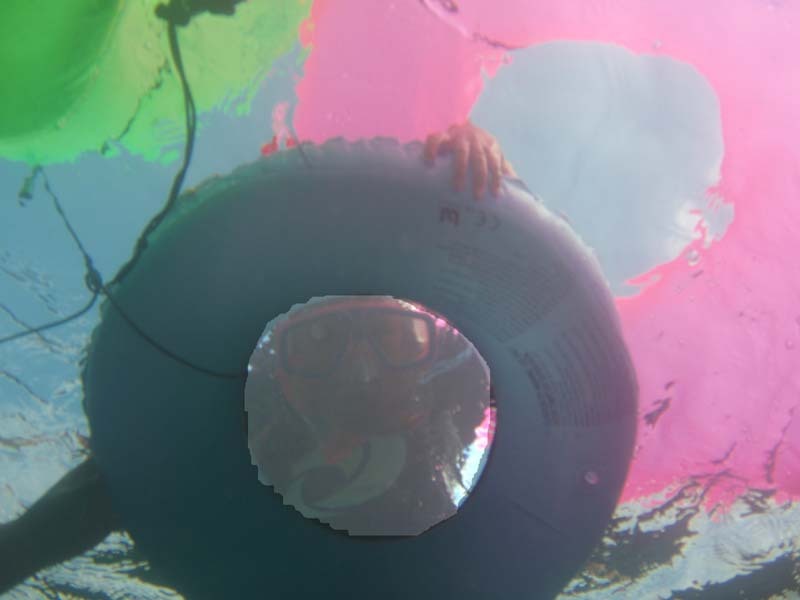 I had a bag of abalone and would swim under the floats releasing scraps as I went under. At one point Brittany got quite a start as some fish bumped her. Marissa has a good view. The diving was nice. 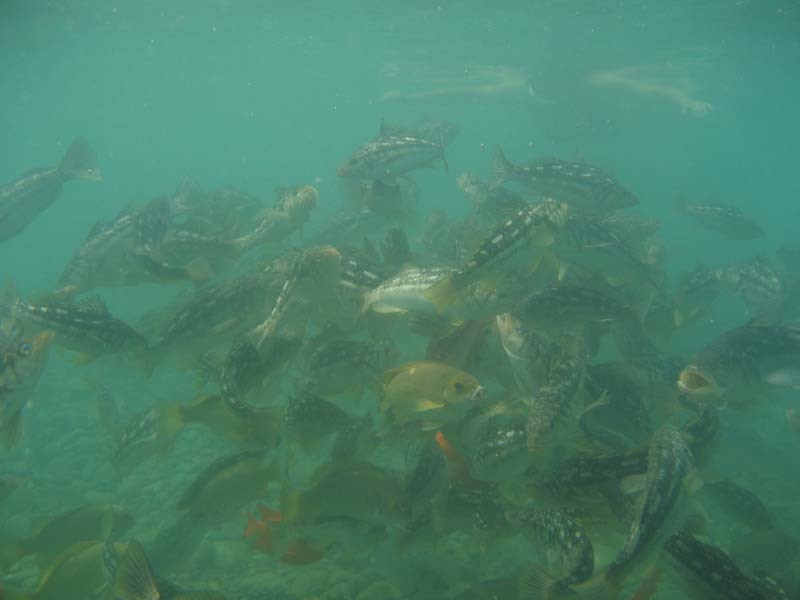 The fish were everywhere including in about 4 feet of water where there was only beach rock. Some of the bass were huge and there were lots of brilliant colored garibaldi. At about 10 feet, macrocystis kelp started. In the rocks there were lots more bass, but also some sheepheads and perch. 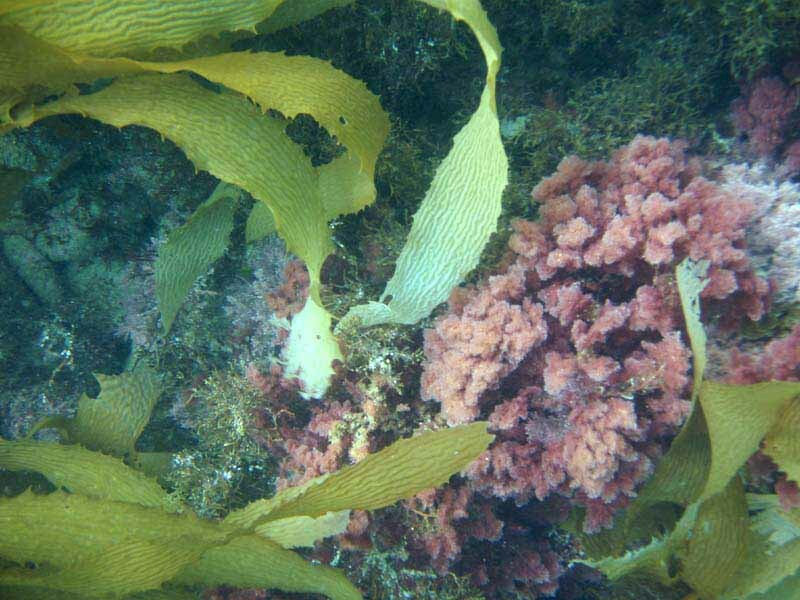 There were lots of the various smaller colorful seaweeds that are typical of the Catalina shallows. We saw small schools of anchovies. I dare say that they were pretty nervous around all those bass. The algaes in the upper 25 feet make for beautiful diving. It wasn't long before the kids were chilled and had to go in. It was in a way too bad, but not unexpected. California diving is a challenge for the hearty. Still, my objective was to show them something new. It was to make a beginning. She looks ready for Galopogos. Joe and I went out again to look around and give him a chance to try some diving. We still had a fair amount of fish food left and created a good deal of excitement. 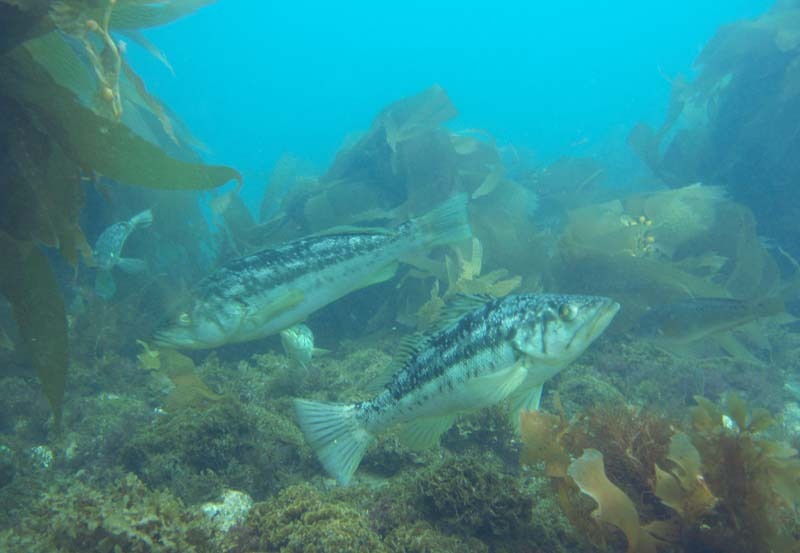 We went out further to where the kelp starts to meet sand patches. It was beautiful and this place has been a preserve for a long time. Last time I was here I not only saw lobsters, I found a couple green abalone. Joe was having a good time. These guys know that they are protected. Well kept fish take all offered handouts. This is Joe's first day trying out free diving. Too soon we headed out and went back to the docks where we met Debbie, Joanne and the kids. 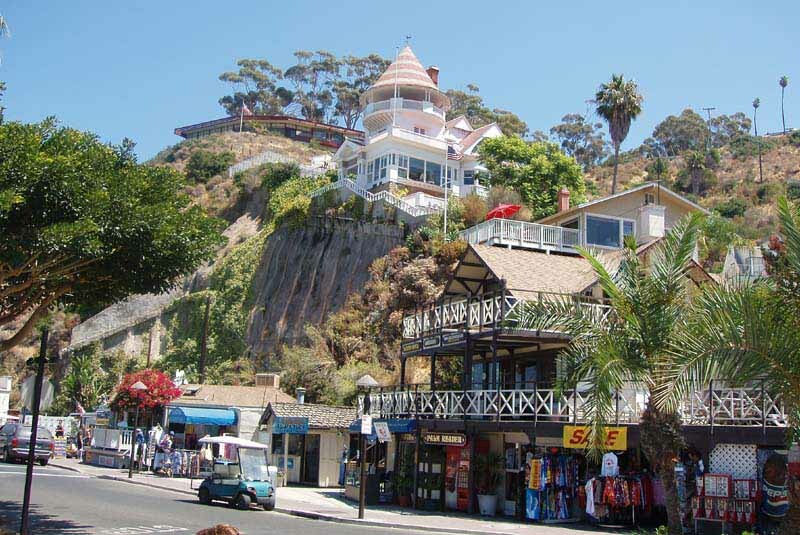 Avalon is a great place to eat and the sightseeing just in town is a lot of fun. We were limited in time so we stopped for a leisurely pizza lunch before heading back to the docks. Catalina is an interesting place. My sister had made a passing comment to me during the week about it, but it still came as a surprise we were finishing up at the lockers when I was suddenly surrounded by nephews and nieces. For the entire trip back, the kids wanted to be out in the open in the back of the boat. Talk about excited. Talk about wind. 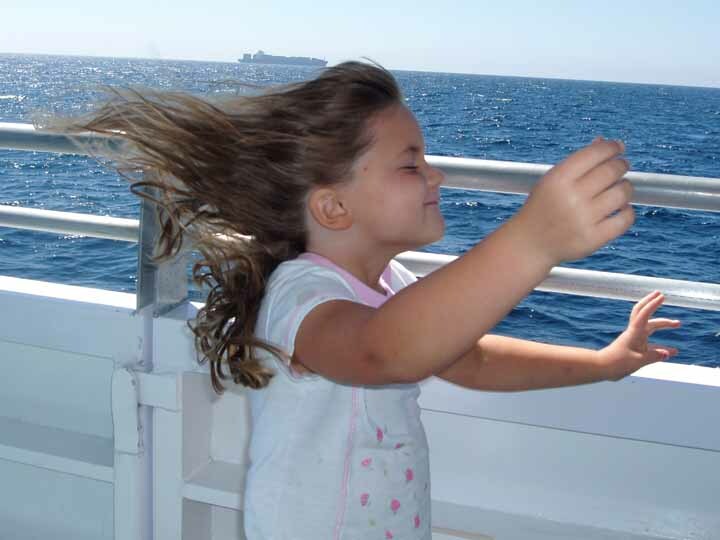 Marissa communing with the wind. The final score is Joe, Joey, Brittany and Marissa all wanted to get certified. I told the kids that I was afraid they were going to have to wait a bit. Marissa was sound asleep before we got out of the parking structure. How would you like a bottle of that energy?